Uncategories Is there some vote splitting in Ontario? A few weeks ago I wrote this article showing that, at that time, vote splitting between the Liberals and NDP was not the reason for a possible Tory victory. This was back when the Conservatives of Ford were close to 40% and had a comfortable lead. The situation have of course changed a lot. The New Democrats of Horwath are nopw ahead in the popular vote and the seat lead of the Tories have shrunk (they are still favourite though). So time to re-do the analysis. As for the first time, I used the second choices as given by Mainstreet and Innovative, they are both very similar and haven't changed much from last time. Basically, the OLP and NDP have each other as main choice (by a good margin) while a majority of PC voters doesn't have a second choice. Those of do prefer the NDP over the Liberals. So, what are the results? The table below shows you what would likely happen in two possible scenarios. In one the OLP wouldn't exist and I redistributed the Liberals vote according to their second choices. In the other I did the same with the NDP. It does appear that there is now enough vote splitting going so that the Conservatives of Doug Ford wouldn't win if the OLP didn't exist. It's not surprising. With the NDP being so close behind the Tories, imagine if they were to receive a boost of almost half of these votes while the PC would recover barely 13%. Interestingly, the Liberals wouldn't be able to prevent a PC majority if the NDP didn't exist. 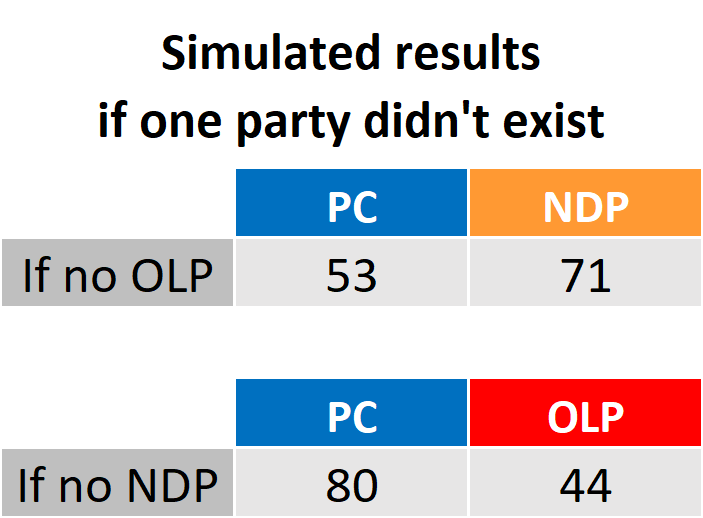 This is partially due to the fact there would a slightly lower transfer of votes from NDP to OLP than in the previous scenario. In general though, the lead of the PC over the OLP in many ridings is just too big and the seat wouldn't be flipped by redistributing the NDP votes. This is obviously due to the current electoral system. If that bugs you, you can try to vote strategically. There are many resources out there. Just know that this is a very uncertain exercise and unlikely to work (as it requires many other people to do the same). I'd also like to mention that the OLP dropping has helped the PC more in the last week since many seats in Toronto are now narrowly won by the PC. So it's not sure what would happen if some OLP voters were to switch to the NDP. For instance, one of the last 3 seats projected to go OLP is Vaughan-Woodbridge. But the PC is projected second there. If 5% of the Lib vote were to switch to the NDP in that riding, that would flip the riding from red to blue.